This is going up a little late, but I thought it was worth posting anyway! This Saturday I went to the Jay's game in Toronto with some friends and naturally had to have my nails match the occasion. I used the new Nails Inc. Gel Effect polish in Mercer Street as the blue on most of my nails and then applied two coats of white (Deborah Lippmann's Amazing Grace) as an accent. 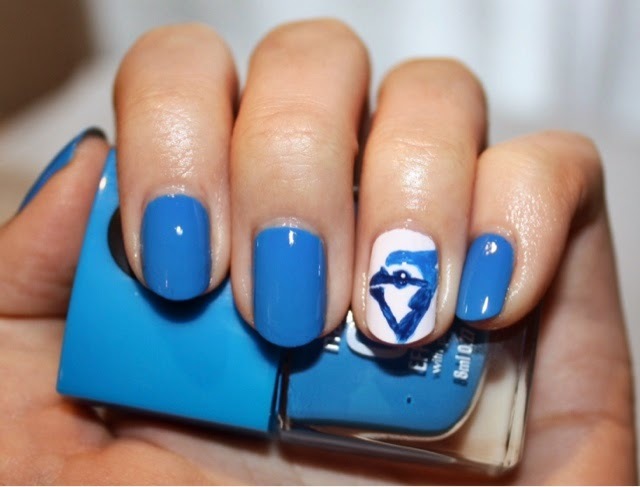 For the blue jay design I actually used a Sigma E05 eyeliner brush to apply Mercer Street and OPI Keeping Suzi at Bay. All content and images property of Jessica Clara Noelle Grant unless otherwise stated. Powered by Blogger.